Where to start with Dr. Rima Ash! She was the mastermind behind the programming of my successful Deep Brain Stimulation surgery in 2013. She’s a hiker who defies heights, a conservatory trained violinist, and more. She places the utmost importance on staying well-balanced, and enjoys running and cycling in addition to being a dedicated yoga student. She bikes to work as well! As the Movement Disorder specialist at Kaiser Permanente San Francisco, she has an incredible background of education at the University of Florida College of Medicine, Gainesville, FL, an internship at Medical University of South Carolina School of Medicine, Charleston, SC, with her residency at the Medical University of South Carolina Medical Center. She did her fellowship at UC San Francisco Medical Center, San Francisco, CA. 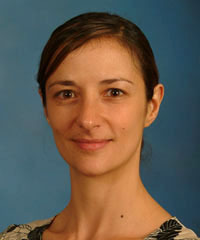 She has a Board certification in Neurology with the American Board of Psychiatry and Neurology. This is her bio from Kaiser Permanente San Francisco. “I am thrilled to have a position at San Francisco Kaiser Permanente among physicians who are a mixture of academicians and community advocates. What attracted me to work here is Kaiser Permanente’s philosophy. I’m able to spend time with patients and do what I think is best for them rather than allow their insurance plan to dictate what is best. This gives me the opportunity to build long term relationships with members and to learn more from their experiences; therefore, allowing me to provide the thoughtful and individualized care needed. We also have many non-pharmacological treatment options such as acupuncture, physical therapy, and educational classes that I feel can empower the patient and provide them with many options to choose from in order to make an informed decision about their own health care. If you are a Kaiser member and would like to see Dr. Ash, please have your doctor place a referral to the Kaiser San Francisco Neurology department. Hello, I’m writing because I’m concerned about my friends daughter who has uncontrollable movements that started about a year ago. She’s been to many doctors and they still don’t know what the diagnosis is. She’s 18 years old and has a wheelchair to help her. Please help her find out what it is. It sounds like Dr. Ash may be able to diagnose her. Please consider. She is a Kaiser patient and maybe she can see Dr. Ash. Hi Dr. Ash. This is Olivia Burch from the Medical University of SC. I just want to say hello and hope your doing well.